You all remember Mr. Vitamix, yes? The love affair is still very much alive and well. We blend something with the Vitamix probably four times a week, at least. He has a permanent spot on our kitchen counter and in my heart. Do you really use it often? Yes. 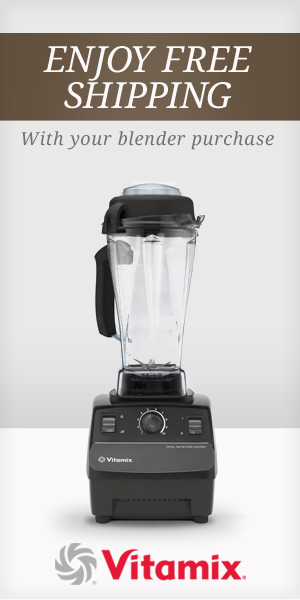 I use my Vitamix much more than I used any previous blender. It just draws you into blending and juicing and pureeing. Tell me about the weird stuff you can blend in it. You can add so many veggies to your smoothies and not even notice it! Leafy greens, carrots, squash, broccoli, etc... it all just gets pulverized into a smooth, delicious drink. I promise. With other blenders, I couldn't imagine adding kale to a drink but this one... this one works. Can you make fresh juice in a Vitamix? Well, yes. You can add your fruits and veggies along with a bit of water and make what Vitamix calls a "whole food juice". Fair warning though, this is different from what an actual juicer will make because it leaves in all of the fiber and pulp. So it can be a bit grainier than actual juice. There is always the option to strain out that pulp from the juice using a coffee filter or nut milk bag. I've done that, and while it's not a bad option at all, it is kind of a pain to rinse out the nut milk bag afterwards. I don't do it often. Can it really heat up soups and sauces? You bet. We've only made hot things in there once or twice, because I personally think it's just as easy to make those things on the stovetop. We made a vegan alfredo sauce with cashwers that was delicious and it got steaming hot in the Vitamix. It does, however, need to run continuously for 5-10 minutes to heat something up and that's a long time for that much noise. Speaking of noise, is it crazy loud? It's kind of loud, about what I expected from a two-horsepower machine. Smoothies typically take a minute or so to blend, so that's not too bad. We use to blend regularly with nearby neighbors and never feel too bad about it, but I suppose it could wake a sleeping baby if their crib was nearby. Don't you hate cleaning blenders? I do. For most things you make in the Vitamix, you can just rinse it out to clean it or you can fill it up halfway with soapy water and run it for a minute to clean it. It's actually really easy. Maybe once a week I give it a good scrubbing or whenever I make something stickier in there. Tell me about it's ice-crushing capabilities. It's a beast. It crushes ice like a monster, without even a hiccup. There is a Whole Fruit Margarita recipe that calls for tequila, one whole peeled lemon, lime and orange and ton of ice and it purees up beautifully. Occasionally when you load it up with harder-to-blend things, you have to use the tamper that it comes with to push everything down into the blades and remove air bubbles. It's a big plastic stick that you shove in there, but it's too short to ever get caught in the blades. Can you mill your own flour? Yes, but you need the dry blade attachment, which I don't have. Is the Vitamix worth the money? It really is. It's a big investment for a small appliance, but it has actually changed the way I eat. I make smoothies three times as much as I used to and I'm able to pack in a ton of fruits and veggies in each one. I've had mine for nine months now and haven't regretted it a single day. 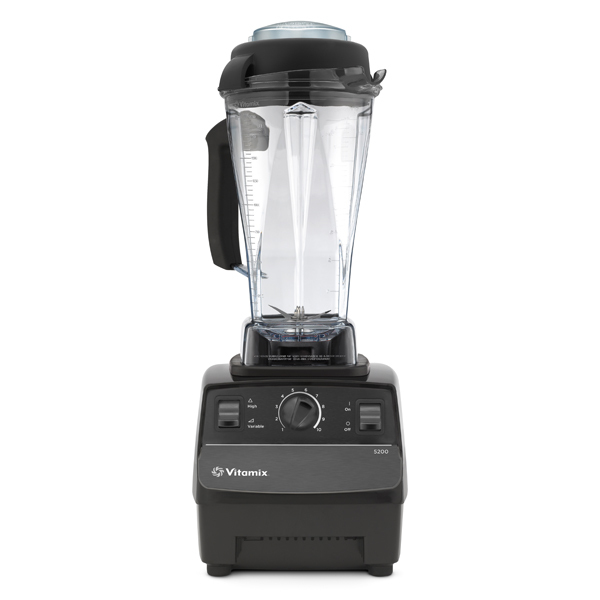 Ok, the exciting news is that I'm now a certified Vitamix Affiliate, which means I can offer you blending freaks free shipping on all Vitamix 5200 blenders (which is the one I have, and the one I would recommend for most of you). Click here to order your Vitamix with free shipping, or click anytime on that little banner in the sidebar. You are welcome. Blend away, sweethearts. I'm in Indianapolis this week for work, soaking up the knowledge and expertise at a premier philanthropy conference. I had gotten my hopes up because I heard about this zip line that you could take throughout downtown Indy. (Video!) You could zip line through the city. WHAT?! Apparently, though, that was only available during the Superbowl season. I am incredibly disappointed. If you have any tips of things to check out during my free time in Indianapolis, leave them for me in the comments, on FB or on Twitter. So far, I've managed to take an accidental hour and forty five minute walk around the IUPUI campus and downtown Indy and go for a run at precisely the moment it started raining. Sooo, I need a little guidance. I will say that Indianapolis seems like a pretty sweet city. Just need a few suggestions, if you have them. Congratulations to From Scratch Club for a great article in the Times Union yesterday! Right on the front page of the Food section. Special congrats to Christina Davis for leading the way in building community around food, right here in our region. The blog, the community outreach tables, the food swaps... it's all bringing people together and making food matter. I'm happy to be a part of it. Click the following photos to enlarge & read. For the record, that now-infamous Topsy Turvy planter never actually yielded tomatoes. That detail doesn't translate to print well, does it? :) Anyhow, have a great weekend everyone. Sorry the posting has been so light here... but, well that's the way it is. I'm surprised I even got this one up today after last night's killer All Over Albany's 4th Birthday Party. Drinks, snacks, cupcakes & a beautiful-if-a-bit-freakish warm evening with friends and strangers, followed by a nice walk home. If you happen to grab a copy of today's Wall Street Journal, go ahead and flip to the front page of the Personal Journal section. There I am! Making cheese! What?! Yes. Because the world is a crazy place, I am featured in today's Journal story on home cheesemaking and DIY dairy products. Guess I won't be cutting out too much dairy, at least not this month :) After making sure the reporter knew that I was a total novice at cheesemaking, relying primarily on the sangria-fueled cheesemaking party of last summer for my experience, she confirmed interest and sent a photographer to document the making of mozzarella in a less-than-40-square-foot kitchen. I tell you people, if I can make mozzarella in my kitchen, you can make it in yours. I asked Sister to come over and act as my sous chef. With the click click of the camera, we whipped up a ball of fresh mozzarella in under an hour with only minimal nervous laughter. If you are a WSJ subscriber, you can read the online article here. Anyone can check out the entire photo slideshow, and you are allowed to politely giggle at the funny faces I'm making. Thanks to Alina Dizik, Erica Beckman & John Francis Peters who made my WSJ debut so comfortable and easy. And for somehow including little ol' me in a story with DIY rockstar Ashley English. Thanks also to the ladies of FSC for throwing that cheesemaking party.